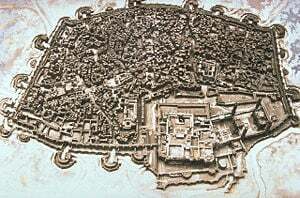 The Walled City of Lahore, also known as the "Old City," or "Anderoon Shehr (اندرون شهر)," constitutes the section of Lahore, Punjab, Pakistan fortified by a city wall during the Mughal era. Also call the Mud City (Kacha Kot) owing to the original building material of the walls, has its origin in the ancient history of India. The original building of Lahore may have taken place 4,000 years ago, in 2000 B.C.E., making the ancient city of Lahore contemporaneous with the Indus Valley Civilization that lay on the northwestern coast of India and Pakistan. The greatest impact on the Walled City of Lahore's architecture came with the invasion of the Mughals, with the arrival of the five great Mughal leaders: Barbur, Humayun, Akbar, Jahangir, and Shah Jahan. They established the Mughal reputation as some of the foremost royal architects and builders in world history. The Walled City of Lahore displayed their artistic talents. Akbar's reign saw the most extensive building of the walled city. The city became distinguished by its gates, mosques, and palaces. Each of the thirteen gates (Akbari Gate, Bhati Gate, Delhi Gate, Kashmiri Gate, Lohari Gate, Masti Gate, Mochi Gate, Mori Gate, Roshnai Gate, Shahalmi Gate, Shairanwala Gate, Taxali Gate, and Yakki Gate) served a purpose, as with most ancient cities. The British sealed shut all gates but one, the Roshnai Gate, to enhance security. Since independence from the British in 1947, six gates have been rebuilt. Two major mosques have been built in the Walled City. The most famous mosque, the Badshahi Mosque, had been built by Aurangzeb, the son of Shah Jahan. Aurangzeb had modeled the mosque on his master builder father's Jama Masjid in Delhi. Our search for the origins of the original Lahore has immense twists and turns. The time period may start as early as 2,000 B.C.E. based on carbon dating evidence of archaeological findings in the Lahore Fort do suggest this time period. Lahore had many names throughout its history. Mohallah Maulian represents one of the two most probable sites of the 'original' Lahore. Sootar Mandi (the yarn market) inside Lohari Gate, had been called Mohallah Chaileywala Hammam located in Machli Hatta Gulzar, just off Chowk Chalka, Lahore's original red-light area. As late as 1864, the Lohari Mandi area had been known as 'kacha kot', the mud fort. The gradient of the land, the water (nullah's act as excellent guides of gradient and direction) flow and the structure of 'mohallahs' and 'kuchas' and 'kattrahs' give rise to the name "mud fort." The curve of Gali Pir Bola merges with Waachowali Bazaar, and the Lohari Bazaar merges with Chowk Lohari Mandi, and, Chowk Mati merges with Papar Mandi, giving a sense of a small mud fort with a small dwelling 3,500 years ago. Along Lohari Bazaar, just a short distance from Chowk Chakla to the right the street opens slightly, revealing a half-buried archway of 'pucca' bricks and mud. The famous mud fort may have been built by Malik Ayaz, the very first Muslim governor of Lahore. Lohari Gate served as the main entrance to Ayaz's mud fort. Chowk Sootar Mandi constituted one important center of Kacha Kot. The lay of the streets also suggest the boundaries. 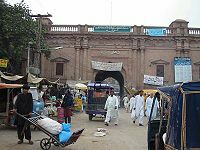 At the time of Mughal Emperor Akbar, the original wall of the Walled City of Lahore stood, on the western side, to the right of Bazaar Hakeeman in Bhati Gate. On the eastern side to the left of Shahalam Gate, curved eastwards and formed a 'kidney shaped' city that depended on the flow of the curving River Ravi. Thus the Lahore of the 'kacha kot' era has continued to expand in three major leaps of expansion, each with an almost 400-year gap. The eras of Raja Jaipal of Akbar and of Maharajah Ranjit Singh mark the high points of that expansion. The expanding of the mud fort had its origins in three factors: (1) the way the Ravi has flown and how and when it has been changing its course. (2) the existence of the Lahore Fort and how power has flowed from the rulers. And (3) the manner the population and economy of the old original Walled City has changed over time, grown, or even shrunk, depending of invasions, droughts and famines in the countryside. The story of 'kacha kot' has been determined by those factors. The oldest buildings in the entire Walled City exist in this area, among them the old exquisite mosque known even now as Masjid Kohana Hammam Chaileywala. A huge 'hammam' may have stood during the 'kacha kot' period. The tomb of Pir Bola (Gali) still exists. Little remains of the original mud fort. The Walled City of Lahore covers an area of 256 ha with a population of 200,000. 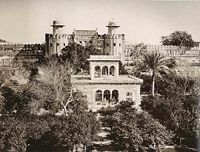 The British destroyed the city walls shortly after they annexed the Punjab in 1849, replacing them with gardens, some of which exist today. The Circular Road links the old city to the urban network. Access to the Walled City still passes through the thirteen ancient gates, or their emplacements. The convoluted and picturesque streets of the inner city remain almost intact but the rapid demolition and frequently illegal rebuilding, taking place throughout the city, has been destroying the historical setting. Some historic buildings have been encroached upon. The few old houses one can still see in the city stand usually two or three stories, with brick façades, flat roofs and richly carved wooden balconies and overhanging windows. Walled City of Lahore had thirteen gates which including: Akbari Gate, Bhati Gate, Delhi Gate, Kashmiri Gate, Lohari Gate, Masti Gate, Mochi Gate, Mori Gate, Roshnai Gate, Shahalmi Gate, Shairanwala Gate, Taxali Gate, and Yakki Gate. All the gates survived till nineteenth century when the British, to derefortify the city, demolished all the gates except Roshnai Gate. Later, craftsmen rebuilt the gates, except for Delhi Gate and Lohari Gate, which they reconstructed as simple structures. Shahalmi Gate burnt to ground during the riots of 1947 while Akbari Gate had been demolished for repairs but never rebuilt. Today, out of thirteen only six survive: Bhati Gate, Delhi Gate, Kashmiri Gate, Lohari Gate, Roshnai Gate and Shairanwala Gate. Some of those gates require urgent attention for repairs and restoration. Bhati Gate "Bhati Gate" provides an entrance through the western wall of the old city. The area just inside the gate has become well known restaurants. 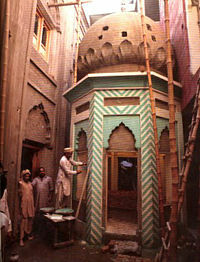 The Data Durbar, the mausoleum of the Sufi saint Ali Hajweri (also known as Data Sahib Ganjbaksh), sits just outside of "Bhati Gate." Every Thursday evening Naat Readers and Qawawals (who perform Qawwali) gather here to read Naat and perform religious Qawwali. Delhi Gate The "Delhi Gate," once the main and only road that led from Lahore to Delhi, had been built during the Mughal era. The gate, suffering greatly in the riots during independence, has since been renovated and returned to its former glory. Kashmiri Gate The "Kashmiri Gate," so named because it faces the direction of Kashmir, has a shopping area called "Kashmiri Bazaar" and a girl's college just inside the gate. That college, built upon an old haveli belonging to a shah, provides a beautiful example of Mughal architecture. Lohari Gate The "Lohari Gate," standing close by the "Bhati Gate," had been built, like many other gates, to keep invading forces out. Although shops and stalls now surround it, glimmers of great architectural work may be seen. In Urdu "loha" means "iron." The gate received the name Lohari because many lohars (blacksmiths) workshops operated just outside the gate. Roshnai Gate The "Roshnai Gate," also known as the "Gate of Lights," stands between the Lahore Fort and the Badshahi Mosque. As the gate served as one of the main entrances into the city, omerahs, courtiers, royal servants and retinues constantly visited it. In the evenings, officials lit up the gate, hence its name. The only gate to have retained its original condition, it has been also referred to as the "Gate of Splendour." Shairanwala Gate Maharaja Ranjit Singh built the "Shairanwala Gate," also known as the "gate of the lions." After its completion, Singh placed two live lions (or Shers) in cages at the gate as a symbolic gesture to warn any invader. Masti Gate Just behind the Lahore Fort stands the "Masti Gate" entrance. Wholesale shoesellers who sell both traditional- and Western-style shoes dominate the area. 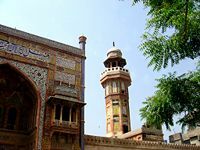 Located further down the street stands one of the city's oldest mosques, the Mosque of Mariyam Zamani Begum, named after the mother of Jahangir, Mariyam Zamani. Mochi Gate Located at the entrance to Mochi Bagh (garden) and amidst a bustling bazaar (market), the historical gate "Mochi Gate," built during the Mughal period, opens. In Urdu "Mochi" means cobbler which may indicate that the bazaar had been a market for shoes and repair shops. Alternatively, according to legend, the gate had been named after Moti, a guard of the gate during the Mughal era, who guarded and looked after the gate all his life. Later the name distorted to Mochi. Today the bazaar around the Mochi gate has won renowned for its dry fruits, kites and fireworks. Mochi gate serves as the entrance to the Mochi Bagh, where many renowned Pakistani leaders of past and present have delivered speeches. Mori Gate Located between the Lohari Gate and Bhati Gate, the smallest gate of in the walled city, the "Mori Gate" stands sentry. Waste and garbage from the city passed through the gate daily. Mori Gate never had been considered an official gate, but the residents of Lahore call it the 13th gate. Shahalmi Gate The "Shahalmi Gate" had been named after one of the sons of the Mughal emperor Aurangzeb, Shah Alam I. Before his death the gate had been renamed the "Bherwala Gate." During independence, the gate burnt so today only the name survives. One of Lahore's biggest commercial markets, "Shah Alam Market," exists near the site of the gate. Tixali Gate The "Tixali Gate," also known as the Tixal (royal mint), had been built during the Mughal reign. Sheikupurian Bazar, a famous shoe market, conducts business nearby. Shops sell a variety of local cuisine at the gate, one of the most beloved being Sri Pai from Fazal Din aka "Phajja." Taj Mehal and Shahbudin Halwi number among popular sweet stores. Yakki Gate The "Yakki Gate," named after the martyr saint "Zakki" who fell while defending the city against the Mughal invaders from the north. Over time, the name "Zakki" became distorted to "Yakki." 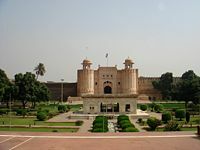 The Lahore Fort, locally referred to as Shahi Qila citadel of the city of Lahore, Punjab, Pakistan, located in the northwestern corner of Lahore, adjacent to the Walled City. Famous sites exist within the fort: Sheesh Mahal, Alamgiri Gate, Naulakha pavilion, and Moti Masjid. The fort measures 1,400 feet long and 1,115 feet wide. In 1981, UNESCO designated the fort a World Heritage Site along with the Shalamar Gardens. The Mughal Emperor Aurangzeb built the Badshahi Mosque (Urdu: بادشاھی مسجد), or the 'Emperor's Mosque', in 1673. One of the city's best known landmarks, the mosque has become a major tourist attraction epitomizing the beauty and grandeur of the Mughal era. The second largest mosque in Pakistan, after the Faisal Mosque in Islamabad, Badshahi can accommodate over 55,000 worshipers. The architecture and design of the Badshahi Masjid closely relates to the Jama Masjid in Delhi, India, built in 1648 by Aurangzeb's father and predecessor, emperor Shah Jahan. The Wazir Khan Mosque in Lahore, Pakistan, famous for its extensive faience tile work, has been described as ' a mole on the cheek of Lahore'. Shaikh Ilm-ud-din Ansari, a native of Chiniot, who rose to the court physician to Shah Jahan and later, the Governor of Lahore, built in seven years. He started around 1634-1635 C.E., during the reign of the Mughal Emperor Shah Jehan. Commonly known as Wazir Khan (The word wazir means 'minister' in Urdu language. ), the mosque stands inside the Inner City through the Delhi Gate. Data Durbar, the tomb of Hazrat Syed Abul Hassan Bin Usman Bin Ali Al-Hajweri, the famous Sufi saint of South Asia, attracts hundreds of thousands of people each year to pay their respects and to say their prayers. The large complex also includes Jamia Hajveria, or Hajveri Mosque. History of "Walled City of Lahore"
This page was last modified on 17 October 2016, at 18:56.